I walked down to the kitchen yesterday and was a bit too late- my mom prepared a gluten-free loaf of oregano bread. It was sitting in the plate for 30 minutes to rise, so I had time to get her exact recipe and write it down. I walked down and found this loaf waiting to rise. This week for my health advice column in the newspaper, someone asked whether 35 calorie toast was a good idea. I emphasized on the misconception of calories in this country, and how people are so desperately trying to eat “low-fat,” sugar-free,” and “low-calorie” foods- parallel to the obesity epidemic we see. Food is meant to give us energy, and calories are energy. If we are trying to replace these calories with scientific lab made chemicals in order to make them low-calorie, fat-free, and sugar-free, while retaining their flavor, texture, and not to mention shelf-life, then we have a problem. Not only are these chemicals and preservatives unnatural, some are very hazardous to our health. Bread is meant to be made of a few ingredients, water, flour, yeast, salt, and sometimes milk. The addition of 30 preservatives and unpronounceable chemicals is unnecessary. Obviously, corporations are not looking to feed us well, not if it means a tighter wallet for them. Don’t be fooled by a bag of bread advertising itself to you. At the end of the day, there’s nothing like the smell of fresh baked bread in the house. 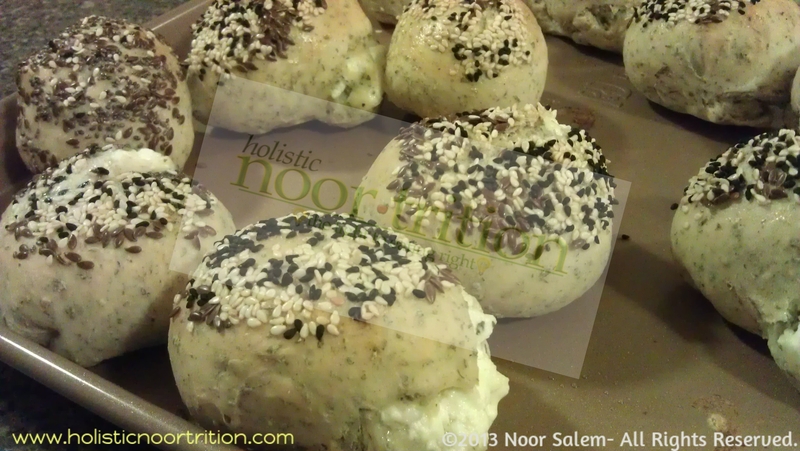 So these buns could be made with gluten-free all purpose flour, or organic unbleached flour. If you plan to use whole wheat flour instead, be wary that it may change the texture of the dough. 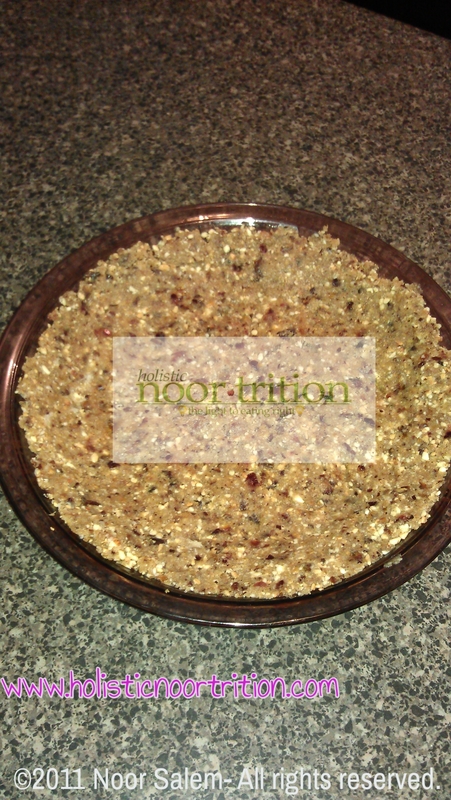 The seed toppings, chia, flax, sesame, and black seed all have numerous health benefits I can write a book about. I believe every kitchen should have those on hand- including yours. If you don’t already use these superfoods, I included links below. Preheat the oven to 450 degrees. Prepare two flat cookie sheets. Place the warm water in a cup with yeast and sugar. Allow to sit for several minutes. Place all dough ingredients (including the water/yeast mixture) in your food processor and pulse until dough-like texture forms. It shouldn’t take too long. Place tough in a glass Pyrex and cover with wax paper for about 20-30 minutes, or until it rises well. Meanwhile, beat the eggs (toppings) in a separate bowl. 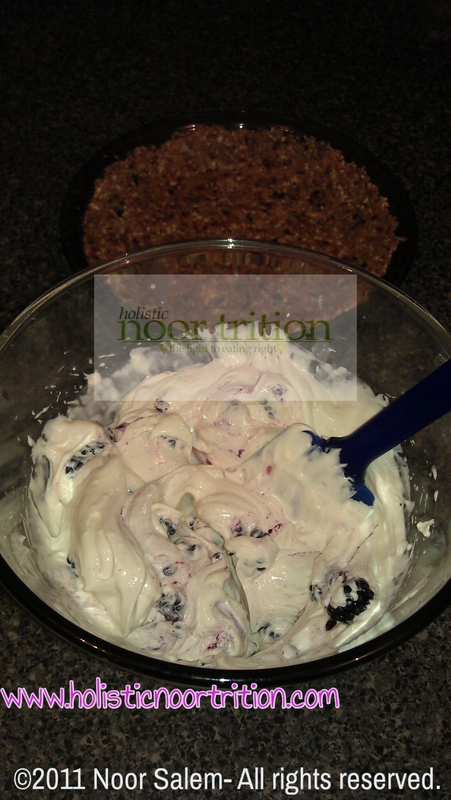 In another bowl, mix all the seeds (toppings) and set aside. Beat eggs in one bowl. 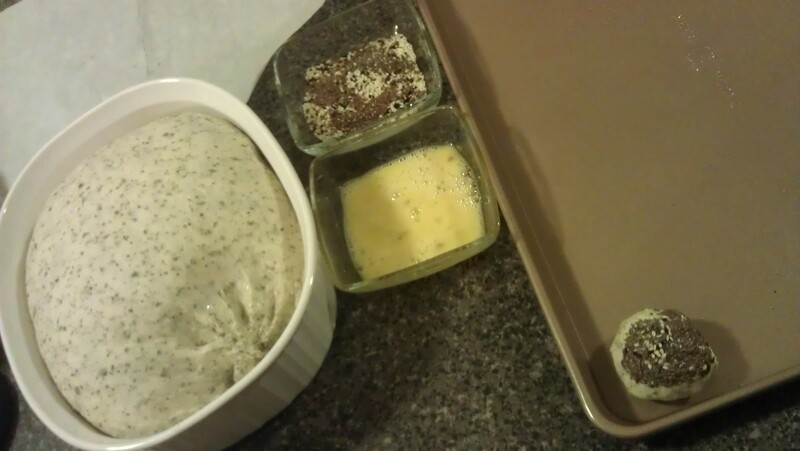 Mix all the topping seeds in another. In a large bowl, mix all the cheese filling ingredients well. 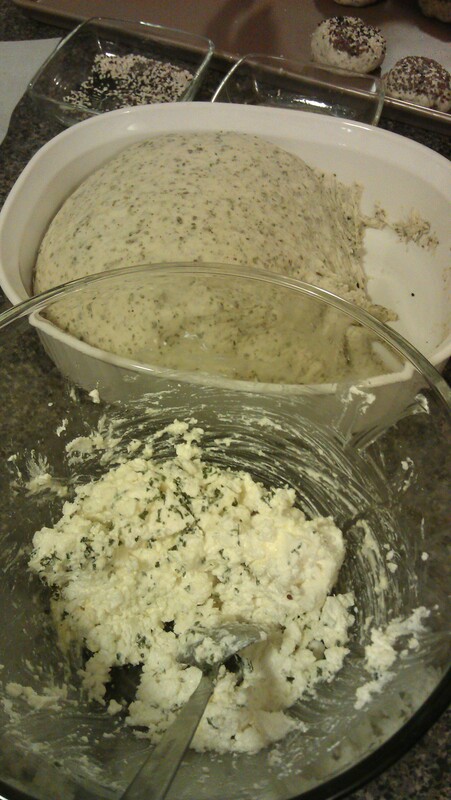 When the dough rises, take a small round in your palm and flatten just a bit. Fill with a scoop of the cheese filling and close with your fingers pressing together the edges well. 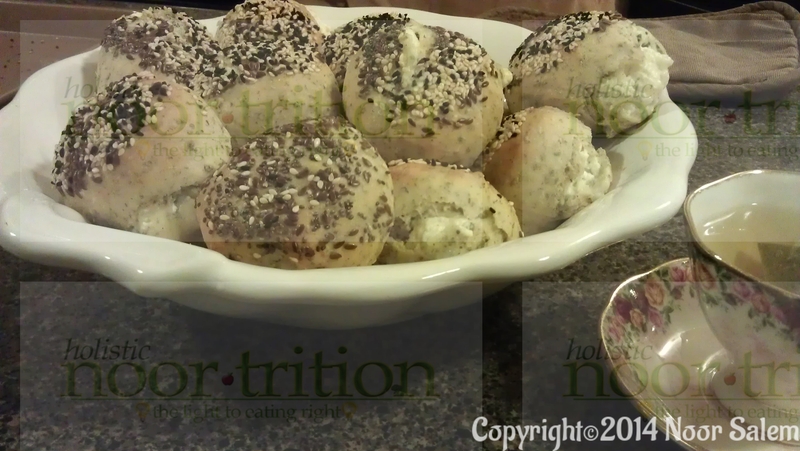 Dip the top of the bun with the egg topping, followed immediately by the seeds topping. Place on the baking dish. Stuff with cheese filling, dip in egg, dip in seeds. Follow step 8 and 9 for all the buns until you run out of dough. Bake for 10-12 mins or until golden brown. Close up after baked. Serve warm with a cup of hot tea. So I took my mother’s popular anise date bars and turned them into mini tart-lets, with no gluten, added sugar, eggs, or dairy. So this is a perfect recipe with people who have intolerance or allergies. My FAVORITE part about this recipe- you simply toss everything in the food processor- just like my famous black bean brownies. 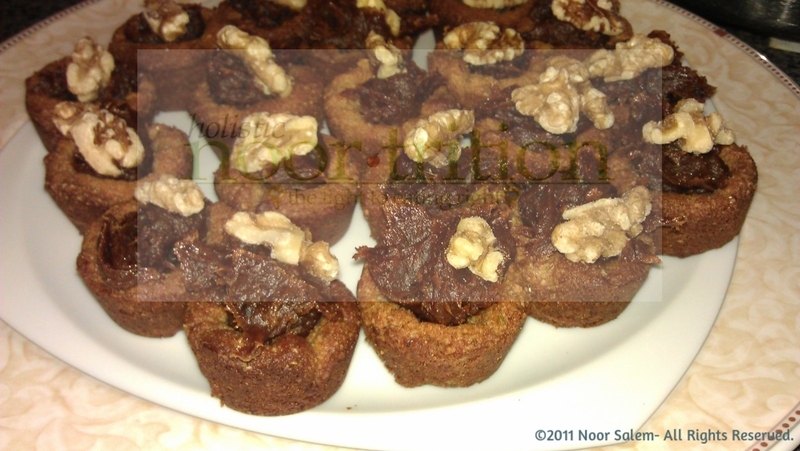 Speaking of brownies, next post up: mini brownie tart-lets with a unique specialty topping. For now, back to the date bites. Almost every ingredient has wonderful benefits, yes, including the pink salt. It’s the only salt I use, close to nature, full of nutrients, and wonderful in taste. Pre-heat oven to 350 F. Grease your mini muffin tin with coconut oil. 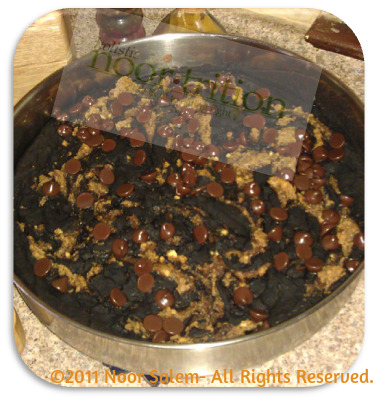 Place all yansoon cookie ingredients in the food processor until dough like. Place cookie dough evenly into each muffin tin in a cup formation, keeping the center a bit open. On your stove-top in a small sauce pan melt together your date filling ingredients. Remove cookies and fill with the date sauce. Top with a half raw walnut. Back for additional 2 minutes. It’s no wonder why cheesecake always has the bad rep; it begins with a crust full of partially hydrogenated oils, bleached flour, and some sugar too. It ends with a sugary topping we misinterpret for “fruit”. Let’s not forget that culpable feeling after eating such a treat. 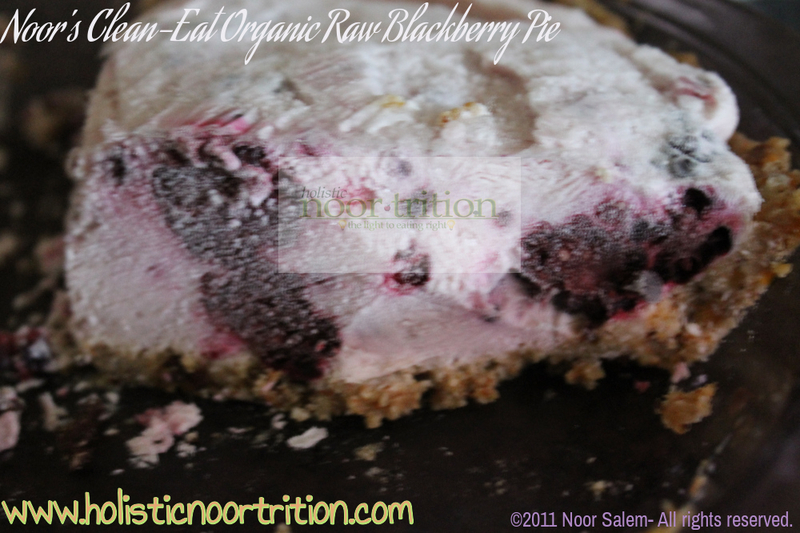 So instead of eating that and having to remorse, I created what I call the Natural Element Blackberry Cheesecake, full of natural ingredients, or “elements” our bodies can digest normally. This is a NO-BAKE recipe and the only tools you need is your food processor, a medium bowl, hand blender, and a spatula. Place all “can’t get healthier crust” ingredients into your food processor and blend well until dough like (the crust would look better w/ chunks of nuts/dates showing but not too coarse). 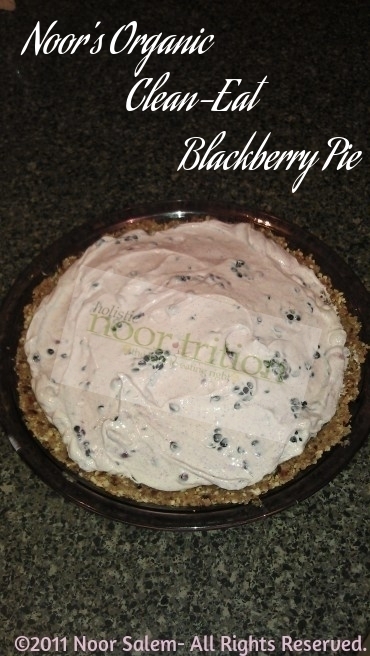 PRESS into a pie pan using a spatula or back of a spoon. 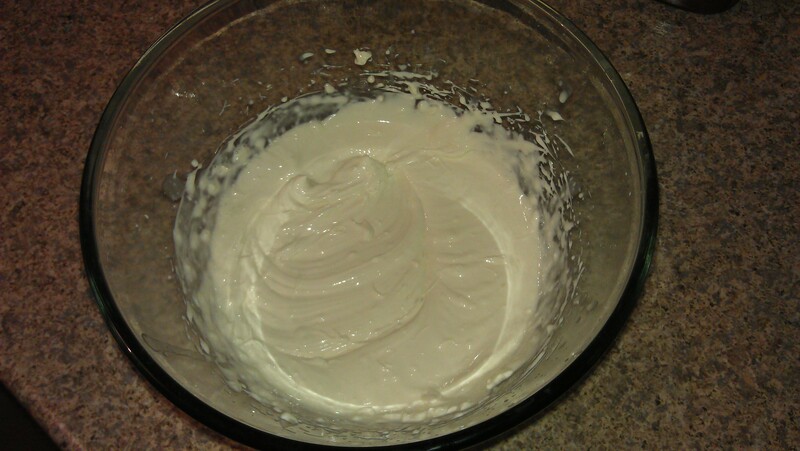 In a medium bowl hand blend the cream cheese, almond milk, and Raw Honey/Coconut Palm Sugar. Blend on medium-high until very creamy and no chunks remain. Hand blend cream cheese, almond milk, and Raw Honey/Coconut Palm Sugar. Cut a few blackberries in half, toss in all berries and fold with a spatula. Scoop into the pie crust keeping the crust showing on the edges. 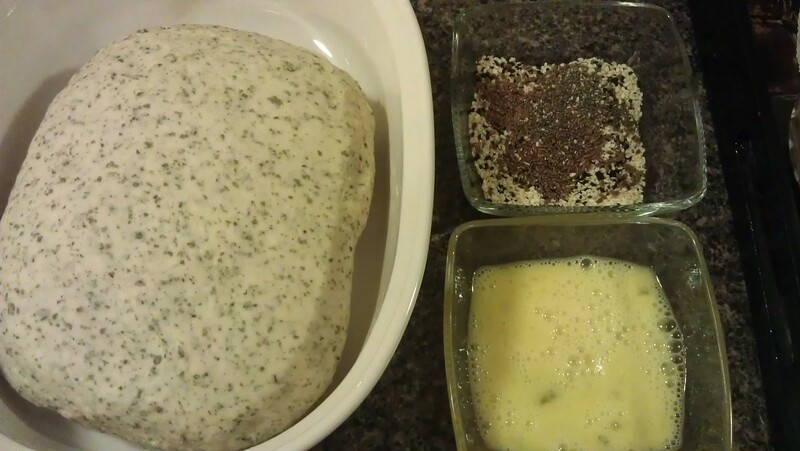 Cover with wrap and freeze several hours or overnight. 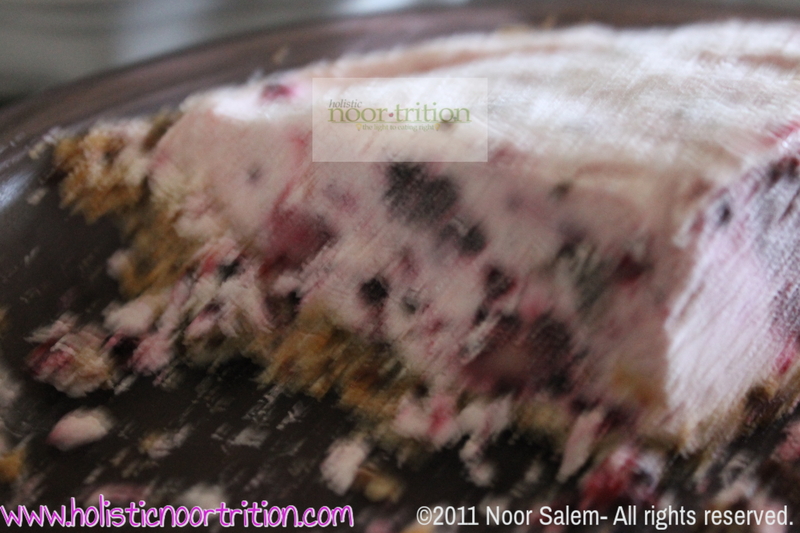 *When ready to serve slice and top with fresh blackberries or make a quick blackberry sauce (smashed fresh blackberries). Zoom in on the good stuff. No bean in sight. 😛 Dairy, gluten, soy, refined sugar, and preservative junk free. 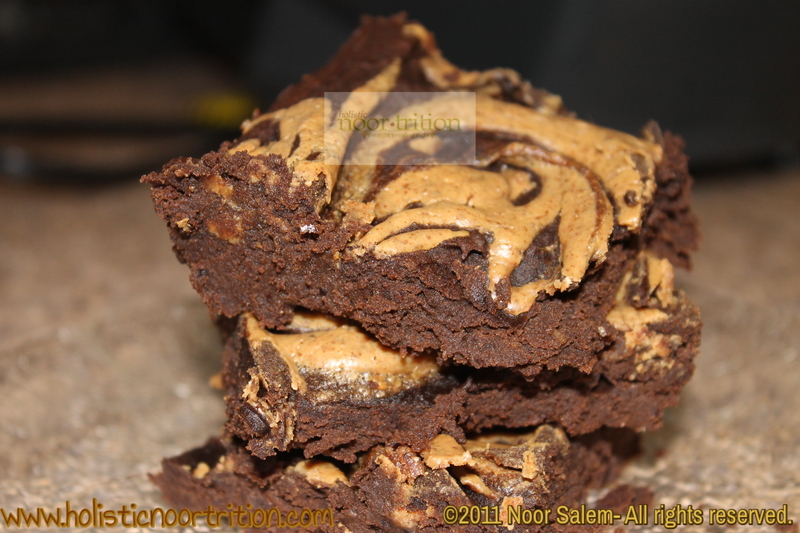 Noor’s famous sunnah-full black bean brownies. 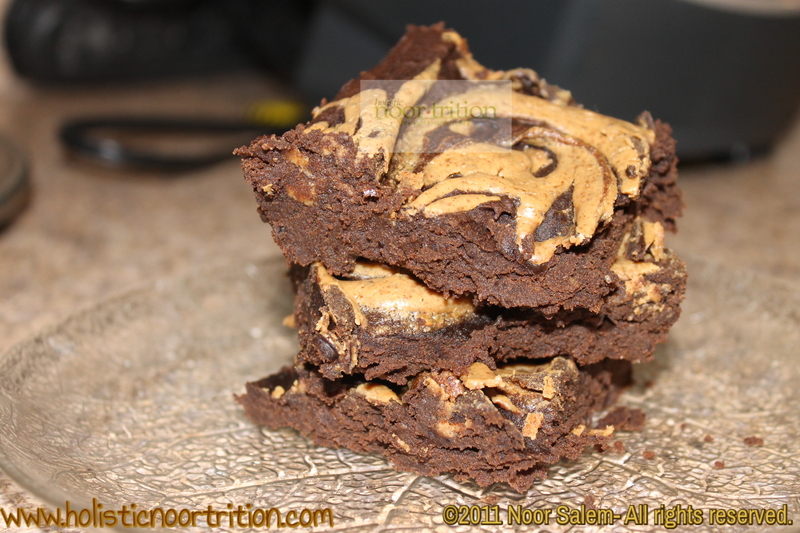 Topped with raw almond butter swirl. Okay putting up a picture of delicious looking brownies does not justify the cravings. “How can these be guilt free?” one asks. Forget gluten free, these are JUNK free. Personally my favorite part about these brownies is this: all you do is toss the ingredients in your food processor all at once, and pulse away! No messy bowls, no sticky whisks, no hand blender, none of that! 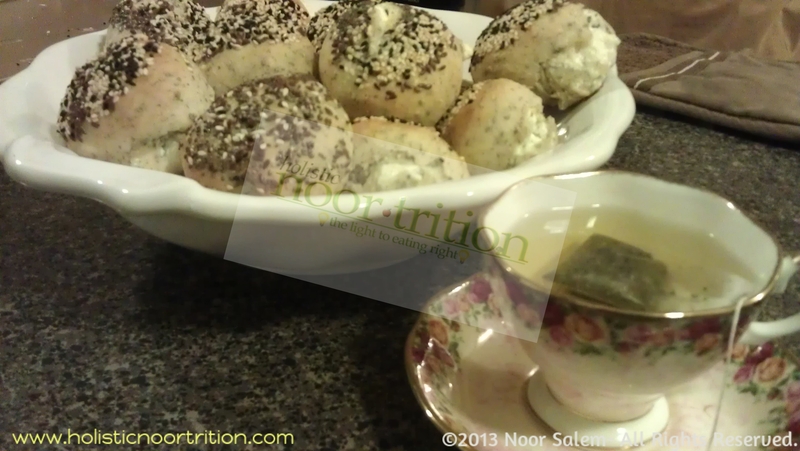 I secretly add in whole black seeds and cold-pressed black seed oil. Black seed has been mentioned in the sunnah of the prophet (pbuh) and is suddenly showing up in research now. The benefits of black seed for many health conditions and diseases is breathtaking. Shhh don’t tell the kids. Now, I don’t want to keep you holding any longer, let’s get to the bottom of these. 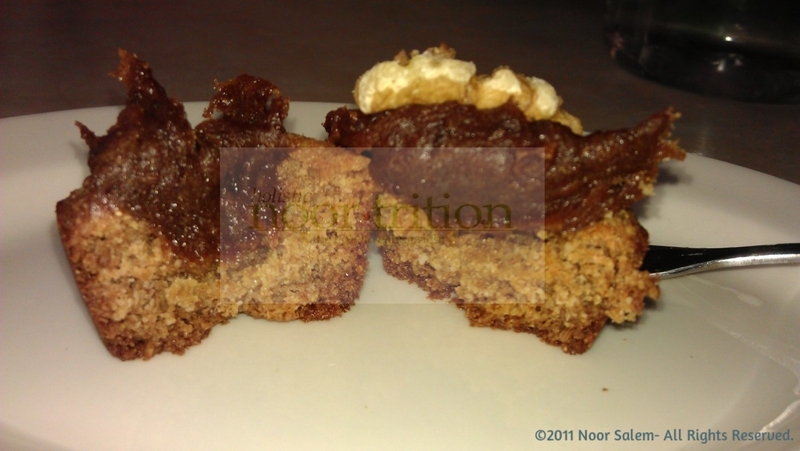 In a small bowl place the “ Nut Butter Swirl Ingredients” and mix well. Spoon on top of brownie batter and create a swirl with a knife. I personally prefer walnut or pecan butter. Place in oven for approximately 25-30 minutes. The deeper the pan the more time they’ll need. Okay here you have it, my secret way of indulgence without sabotaging my health. Enjoy now, you have some baking to do.